1. Grandma’s pumpkin pie. No question here, the only difference is that I’ve started par-baking my pie crust before adding the pumpkin custard to give the bottom crust a chance to puff up and bake. Not a huge difference, so feel free to skip the blind baking if you’re short on time or patience. 2. Pecan tart. Maybe something like this recipe. My dad is a fan of pecan pie at Thanksgiving, but I find that many end up cloyingly sweet and sticky from all that corn syrup. That kind of richness is best served in small portions like a thin tart rather than a deep dish pie. Swapping the corn syrup for honey will give more flavor to the filling without altering the signature gooey-ness. I’ve also made this one in the past with success. Making these in advance is a good idea since the flavors are enhanced the next day. 3. 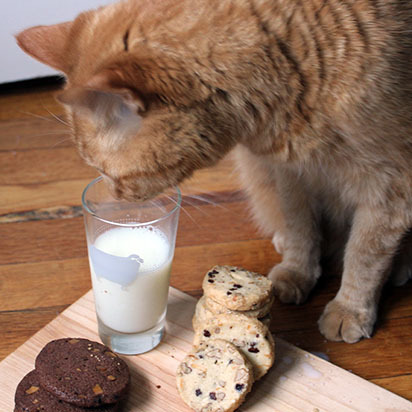 Alice Medrich’s Pecan Nibby Cookies. The dough has been in my freezer for a few months (along with these), but it’s time to clear out for the upcoming onslaught of Christmas cookies. 3. This Nibby Chocolate Chip cookie dough was also taking up freezer space. I added 1/2 tsp of cinnamon because I love that almost indistinguishable whisper of cinnamon in a buttery chocolate chip cookie. The dough can be chilled and sliced instead of rolled if you’re feeling lazy. 4. Thanksgiving morning is a perfect time to exert a little extra energy for a special breakfast 5K run, especially if turkey isn’t scheduled until mid afternoon. 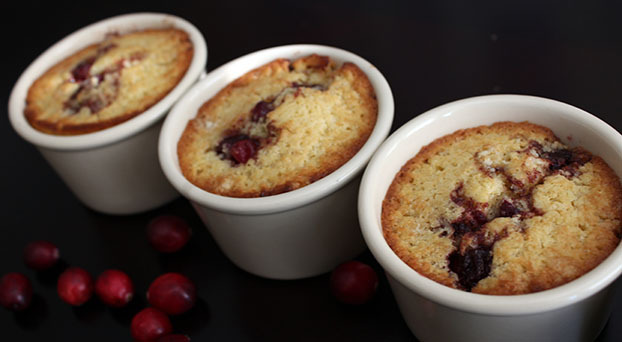 Last year I made this Paris inspired Kouglof; this year I’m planning to serve Maple Cranberry Cornmeal Cake. I always love to put a colorful fruit salad on the table too, and maybe a jar of homemade granola. 5. 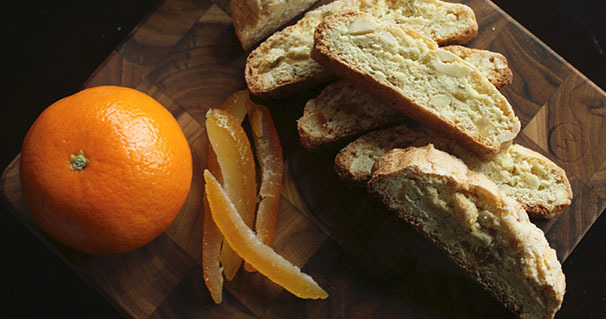 Almond Orange Anise Biscotti. I never go home without at least one variety of biscotti to share. They keep well, travel well, ship well, and have infinite flavor combinations. An all around perfect cookie. Though I never make the same kind very often; these peanut butter pecan ones are my favorite, especially when I throw in a few handfuls of raspberry jelly bits from King Arthur for a PB&JB. Wishing everyone a happy and tasty Thanksgiving! 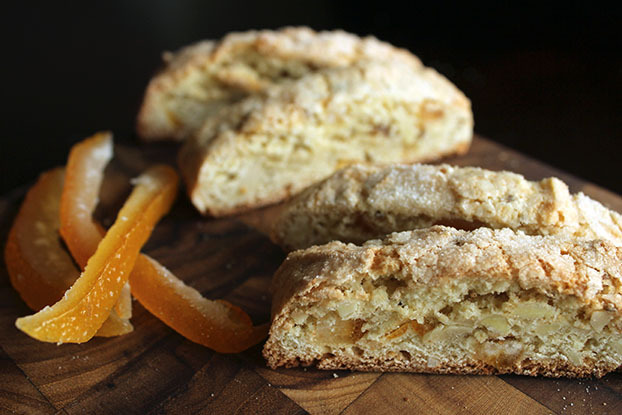 low fat and not too sweet, these biscotti are great for guilt-free, pre-Turkey nibbling; while the candied orange peel and anise give you an inkling of the holiday season to come. This recipe makes a big batch for sharing with the family, and biscotti are easy to bring along to keep up your shopping stamina if you’re hitting the Black Friday sales. Line two baking trays with parchment and preheat your oven to 350°. Combine the marzipan and sugar in the bowl of an electric mixer. Using a pastry cutter (or a fork or fingers), smush the marzipan into the sugar until no large clumps remain. Add the eggs and immediately beat on high to combine until the mixture has lightened and thickened. Add in the vanilla and almond extracts and combine. Mix together the flour, salt, baking powder, and anise seed. Pour the dry ingredients on top of the wet and mix on low to combine. Just before everything is incorporated, add the almonds and orange peel. Beat a few seconds more until everything is mixed. With a stiff spatula (dough will be heavy and thick) scoop the dough into 3 or 4 equal portions on your baking trays. Using slightly damp hands, shape the portions into logs about 1 1/2 inches wide and 1 inch tall. Rewet your hands if the dough starts to stick. Sprinkle about 1 Tbsp of granulated sugar on top of each log. Bake for 20-25 minutes until the logs are set in the middle and turning golden. Remove from the oven and let cool about 15 minutes. Reduce the oven to 275°. Using a very sharp knife, use a quick and assertive motion to cut the logs into slices about 3/4 inch thick (reserving the ends for personal snacking). Stand the biscotti up in rows on an unlined baking tray and return to the oven for 20 minutes. 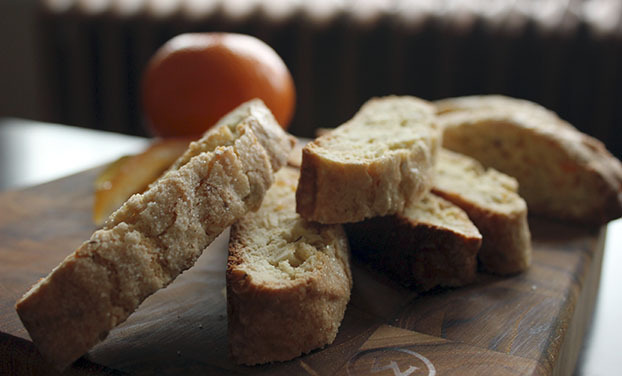 Let biscotti cool completely. Biscotti will keep in an airtight container for 2 weeks.